Fatty Amine Curing Agent Chain Extender PACM, HMDA - ZhangJia Gang YaRui Chemical Co., Ltd. 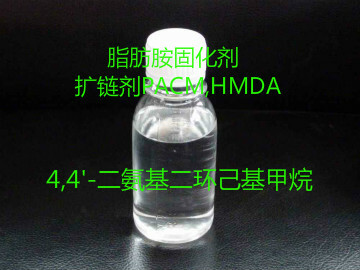 Product Description: PACM (4,4-Diaminodicyclohexylmethane) Is A Colorless, Transparent To Slightly Yellow, Cycloaliphatic Di-Primary Amine With Amine Smell And Soluble In Other Solvents. 4,4'-Diaminodicyclohexylmethane (Fatty Amine Curing Agent Chain Extenders PACM, HMDA) For The Preparation Of Environmentally Friendly And Transparent Aliphatic Isocyanates, Are Urethane, Polyamide Resin, Epoxy Resin Curing Agent For Textiles, Paper, Artificial Leather, Can Also Be Used For Dyes, Pharmaceutical Intermediates. If Fatty Amine Curing Agent Chain Extender PACM, HMDA product is not what you want, we can be customized according to your needs, please send us your order to Email: sales@yaruichem.com , or click here to post your buying lead.